Students return to the Pythagorean Theorem and distance formula they used in Bootstrap 1, this time with data structures and the full update-world function. Standards with prefix BS are specific to Bootstrap; others are from the Common Core. Mouse over each standard to see its corresponding evidence statements.Our Standards Document shows which units cover each standard. Right now, in both Ninja World and your games, nothing happens when the player collides with another game character. We need to write a function change that. This is going to require a little math, but luckily it’s exactly the same as it was in Bootstrap:1. In the image above, how far apart are the cat and dog? If the cat was moved one space to the right, how far apart would they be? What if the cat and dog switched positions? In one dimension, such as on a number line, finding the distance is pretty easy. If the characters are on the same line, you just subtract one coordinate from another to find the distance. However, if all we did was subtract the second number from the first, the function would only work half the time! When the cat and dog were switched, did you still subtract the dog’s position from the cat’s, or subtract the cat’s position from the dog’s? Why? Draw the number line on the board, with the cutouts of the cat and dog at the given positions. Ask students to tell you the distance between them and move the images accordingly. Having students act this out can also work well: draw a number line, have two students stand at different points on the line, using their arms or cutouts to give objects of different sizes. Move students along the number line until they touch, then compute the distance on the number line. Distances cannot be negative, so we have to make sure we are always subtracting the smaller number from the bigger one. If the characters are on the same plane, there are two conditions: if the first number is bigger and the other is if the second is bigger. What kind of function do we need, when we have multiple conditions? What is the Name of this function? Domain? Range? Write two examples for line-length so that it subtracts the smaller number from the bigger one. Start with an example using the numbers 23 and 5, then do a second example with 5 and 23 in the other order. Now we have an idea of the results for the cond statement, but a cond function also needs Tests. We want to test to see whether the first number given to line-length is greater than the second number. How would you write that test in Racket code? And what would the result for that test be? If a is greater than b, which number would we subtract from which? How could you include a test for wheather the two numbers are equal, without adding a third cond branch? Write down the definition for line-length. It is possible to replace the second test with else, because there will only be two options: line-length will either subtract b from a, or a from b. (If the numbers are equal, it doesn’t matter which is subtracted.) However, having students write out the full test and result gets them thinking about what exactly is being tested in each branch of the function. It is possible to avoid using a conditional entirely by taking the absolute value of the difference (the function abs does this); if you are working with older students who already know about absolute value you could show it. Using cond, however, emphasizes how code structure arises from examples. Unfortunately you don’t have any code to calculate the distance in two dimensions. All you have so far is something that tells you the length in only the x- or y-dimension. How could you find the distance between the two points shown in this image? How could you find the length of the dotted line, also called the Hypoteneuse? 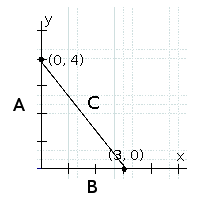 Let’s start with what we do know: the dotted line makes a triangle and we can find out the length of the other two sides, labeled "A," "B" and "C."
What is the line-length of A? To make your life easier, you can use the function you already wrote: line-length. In this example, (line-length A) is 4 and (line-length B) is 3, but we still don’t know C.
Draw this image on the board, with the lines labeled "A", "B", and "C". Ancient civilizations had the same problem: they also struggled to find the distance between points in two dimensions. Let’s work through a way to think about this problem: what expression computes the length of the hypoteneuse of a right triangle? This exercise is best done in small groups of students (2-3 per group). Everyone will have a packet with the same materials, but each group’s triangles are a little different. The activity workes with triangles of all sizes, so each pair will get to test it out on their own triangles. draw the diagram on the board. For any right triangle, it is possible to draw a picture where the hypoteneuse is used for all four sides of a square. In the diagram shown here, the white square is surrounded by four gray, identical right-triangles, each with sides A and B. The square itself has four identical sides of length C, which are the hypoteneuses for the triangles. 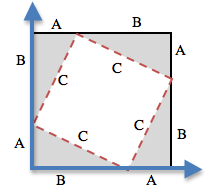 If the area of a square is expressed by , then the area of the white space is . Have students place their gray triangles onto the paper, to match the diagram. 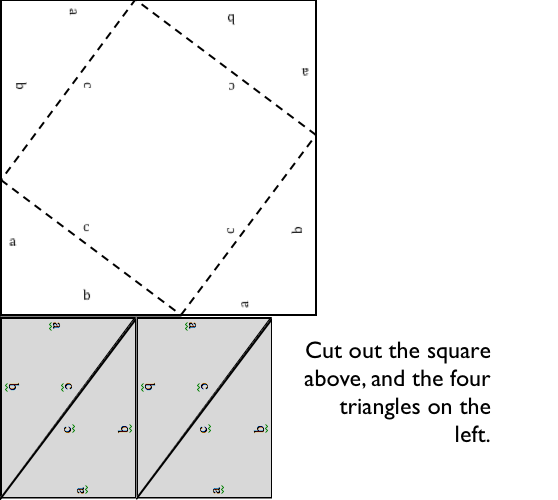 By moving the gray triangles, it is possible to create two rectangles that fit inside the original square. While the space taken up by the triangles has shifted, it hasn’t gotten any bigger or smaller. Likewise, the white space has been broken into two smaller squares, but in total it remains the same size. 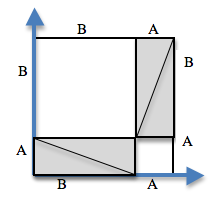 By using the side-lengths A and B, one can calculate the area of the two squares. What is the area of the smaller square? The larger square? You may need to explicitly point out that the side-lengths of the triangles can be used as the side-lengths of the squares. Does the same equation work for any values of A and B? 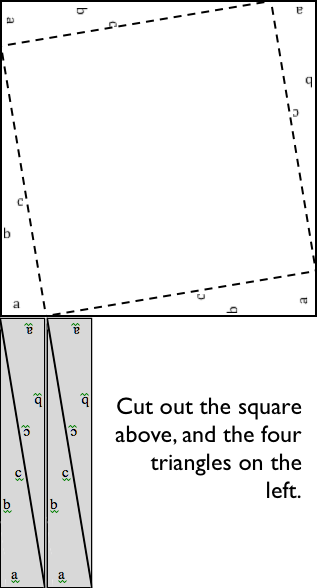 Pythagoras proved that you can get the square of the hypotenuse by adding the squares of the other two sides. In your game, you’re going to use the horizontal and vertical distance between two characters as the two sides of your triangle and use the Pythagorean theorem to find the length of that third side. Remind students that A and B are the horizontal and vertical lengths, which are calculated by line-length. Turn to Page 37 of your workbook - you’ll see the formula written out. Draw out the circle of evaluation, starting with the simplest expression you can see first. Now you’ve got code that tells you the distance between the points (4, 2) and (0, 5). But we want to have it work for any two points. It would be great if we had a function that would just take the x’s and y’s as input and do the math for us. Turn to Page 38, and read the problem statement and function header carefully. Use the Design Recipe to write your distance function. Feel free to use the work from the previous page as your first example and then come up with a new one of your own. When finished, type your line-length and distance functions into your game and see what happens. Does anything happen when things run into each other? You still need a function to check whether or not two things are colliding. Pay careful attention to the order in which the coordinates are given to the distance function. The player’s x-coordinate (px) must be given first, followed by the player’s y (py), character’s x (cx), and character’s y- (cy). Inside the body of the function, line-length can only calculate lengths on the same axis ((line-length px cx) and (line-length cx cy)). Order matters here, as it does with data structures. The distance function will not work correctly if the inputs are out of order!Be sure to check that students are using sq and sqrt in the correct places. So what do we want to do with this distance? How close should your danger and your player be, before they hit each other? At the top of Page 39 you’ll find the Word Problem for collide?. Fill in the Contract, two EXAMPLES, and then write the code. Remember: you WILL need to make use of the distance function you just wrote! When you’re done, type it into your game, under collide?. Using visual examples, ask students to guess the distance between a danger and a player at different positions. How far apart do they need to be before one has hit the other? Make sure students understand what is going on by asking questions: If the collision distance is small, does that mean the game is hard or easy? What would make it easier? Now that you have a function which will check whether something is colliding, you can go back to modifying Ninja World. Out of the four major functions in the game (update-world, draw-world, keypress, and big-bang), which do you think you’ll need to edit to handle collisions? We’ll need to make some more branches for cond in update-world. What should happen when the cat collides with the dog? We want to put the dog offscreen, so that he can come back to attack again. Start with the test: how could you check whether the cat and dog are colliding? Have you written a function to check that? What do the inputs need to be? How do you get the catY out of the world? What about the Cat’s x-coordinate? She’s always in the center of the screen, so what will her x-coordinate always be? How do you get the dogX out of the world? Remember that update-world gives back a world, so what function should come first in our result? And what should happen when the cat and dog collide? Can you think of a number that puts the dog off the screen on the left side? Does the rubyX change when the dog and cat collide? How about catY? How do you get each of those things out of the world? Collision detection must be part of the update-world function because the game should be checking for a collision every time the world is updated. 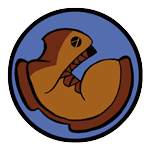 Students may assume that draw-world should handle collision detection, but point out that the Range of draw-world is an Image and their function must return a new world in order to set the locations of the characters after a collision. Turn to Page 40 and write some more tests and results. What characters in your game could collide with each other? What should happen as a result? When you have written each test and result down, type it into your game. Work in small groups to complete collision branches. Congratulations on finishing every lesson! Now it’s up to you to make your game even better. Take some time to brainstorm...what else do you want your game to do? Next unit you can add even more things, so that your games are even cooler. Have students show each other their finished games and start thinking about what features they want to add next!